There was some kind of air show occurring almost every year at the South Haven Airport. They were usually such gala events that as an area bureau news reporter I had to cover them. The family often came with me because they were fun. I remember pancake breakfasts in one of the hangers, and a lineup of restored historic aircraft ranging from old bi-planes to World War II fighters that you could walk right up to. Not only would we get to see historic aircraft, the air shows also were just that, shows of spectacular flying and maneuvering in the sky over our heads. The pilots would bring their planes over us in close formation. They also would do wild looping while special devices emitted a trail of smoke behind them. It was always a daredevil kind of show that kept us entertained and wondering if someone wouldn’t crash in front of our eyes. Among the kind of events held at the airport were parachute jumps. Jump clubs would occasionally gather to parachute down into the airport from high overhead. I attended one memorable show with my son Aaron at my side that almost turned into a disaster. When one team of jumpers loaded into an aircraft for their performance, we watched them pack their chutes, then climb into the single engine aircraft with a side door removed. Then the plane took off. We watched it climb and climb until it was but a spec in the sky overhead. Suddenly the jumpers emerged, one after the other. We could barely see them at first, but as they fell headlong for the earth, they became more and more distinct. Then, one-by-one, the pulled their ripcords and their parachutes opened. All except one. The viewers on the ground moaned as we watched one chute fly up over the jumper’s head, but fail to open. Something had happened and the parachute just flapped like a kite tail over his head. He kept falling faster and faster toward the ground. Each jumper carried a second emergency parachute strapped on their belly for just such an emergency. This young jumper made a terrible mistake that day, however. He pulled the ripcord on his second parachute without first releasing the first. The second chute flew out and entangled itself with the first one. We all watched in disbelief as the jumper fell toward almost certain death. He was about to splatter all over the ground before our eyes. I stood frozen, not believing what I was watching. I even forgot for those few moments that my young son was standing right beside me, watching what I was watching. The jumper was shaking the ropes of the two chutes, desperately trying to get something to open and break his fall. He was getting so close we could see his furious attempts to save himself. Then, at the last moment, one of the parachutes opened. It slowed his fall enough that he survived when he hit the ground. After an examination by the other jumpers, it was determined that the young man came out of it without even breaking a bone. 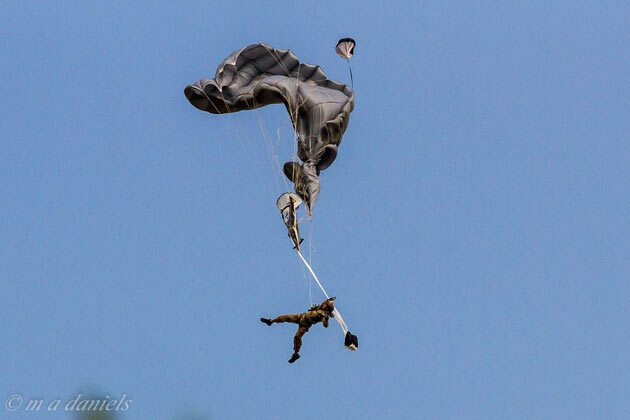 In fact, he repacked his chutes and went up later that day for another jump. I heard his friends advise him to do it or he would probably never jump out of an airplane again. Just watching that event convinced me that parachuting from airplanes would never be a sport that would interest me.